Widely known for the Kennedy Space Center, Port Canaveral is located in the city of Cape Canaveral, home to beautiful beaches and Brevard Zoo. Previously called Little Stirrup Cay, Coco Cay is now a private island owned by Royal Caribbean International. The resort offers exclusive activities and relaxation for their cruise line passengers. Located on the small island of Sint Maarten / Saint Martin, Philipsburg is almost entirely surrounded by beaches. This means that a range of watersports are on offer, as well as water transportation for those looking to discover the area in a unique way. There's also several shopping spots and night activities when it's time to take a break. Accommodating 1-2 passengers, these staterooms feature two twin beds that convert to Royal King, a private bathroom and sitting area with sofa. Guests in Interior Staterooms with Virtual Balcony will also benefit from a high-definition screen that spans nearly floor to ceiling, providing real-time views of the ocean and destinations. Guests in Promenade Staterooms will also benefit from bay view windows overlooking Promenade. Studio Interior Stateroom feature a full size bed and full bathroom and are available for single occupancy at no single supplement. These Suites and Staterooms feature the same amenities as their regular-sized counterparts, whilst offering additional space for passengers that require it. Two deck high stateroom with panoramic views. Master bedroom and bath on second level. Bedroom has two twin beds that convert to Royal King. Bath has a shower for two. Stairway to second level. Bath with shower for two on main level. Private balcony with dining area. Dining area with dry bar. Living room sofa converts to double bed. Closets on each level. Two deck high stateroom with panoramic views. Master bedroom with Royal King size bed and bath on second level. Bath with shower on main level. Private balcony with chairs, dining area with dry bar, table/desk. Living room sofa converts to double bed. The innovative new Family Connected Staterooms mean that family and friends can now connect up through three different types of adjoining staterooms, to create a unique home base at sea. The bedrooms are all separate and everyone gets their own bathroom. A great option if you want to spend time with your family but also want to enjoy some quiet time alone. Accommodating 1-2 passengers, these staterooms feature two twin beds that convert to Royal King, a private bathroom and sitting area. Boardwalk and Central Park View Staterooms also benefit from a bay window leading onto the Boardwalk and Central Park neighbourhoods. Studio Ocean View Stateroom feature a full size bed and full bathroom, and are available for single occupancy with no supplement. Featuring two twin beds that convert to Royal King, a private bathroom with tub, sitting area with table and sofa, these suites can accommodate up to two passengers. Accommodating two passengers, these cabins feature two twin beds that convert to Royal King, a private balcony, a sitting area, as well as a private bathroom. The largest accommodation at sea, the Royal Loft Suite is ideal for families of up to six, who want to relax in spacious surroundings. This two deck high stateroom features panoramic views. Master bedroom and bath on second level. Bath has a tub, shower, two sinks and bidet. Stairway to second level. Four twin beds that convert to two Royal King beds. Bath with shower on main level. Private balcony with whirlpool and dining area. Dining area with dry bar. Living room sofa converts to double bed. Closets on each level. Treat yourself to the most exclusive, fine-dining restaurant onboard. A meal and experience you’ll never forget. Whether it’s a morning cup of coffee, a decadent Caramel Macchiato, a refreshing Frappuccino® Blended Beverage, or a tempting pastry, guests can enjoy all their favourite Starbucks treats right onboard. Take a trip to Tuscany in this casual Italian eatery that has a dish to tantalise any palate. Royal Caribbean’s popular signature steakhouse, featuring grade-A premium cuts of steak cooked to your specifications, plus fresh seafood, hearty side dishes and signature desserts in an upscale, contemporary setting. Grab a bite at this deli-style eatery, with made-to-order salads, panini, sandwiches and pastries to choose from. When you’re having big fun at the Pool and Sports Zone, you want to grab a snack and get back out there. So head to Mini Bites for grab-and-go sliders, grilled cheese and other deliciousness. Enjoy an expansive menu of delicious dinner options in early and late seating dining — as well as the flexible My Time Dining program. Step into this ‘50s diner, which features red booths, Formica counters, a jukebox, burgers, fries and the best old-fashioned malted milk shakes. Dishes at this airy venue are light on calories but big on flavour, so you can eat healthily onboard without having to sacrifice taste. After a workout or any time, enjoy a healthful selection of specialty wraps, fresh fruits, yogurts, and smoothies. Enjoy feel-good food at this chilled-out café, with offerings including wraps, fresh fruit, smoothies and more. So delicious, you’d never know it was healthy! Stop for a snack at this casual diner, where a selection of hot dogs and toppings are on the menu for a fun, fairground experience. Take a seat at the counter for traditional hot dogs, brats, sausages and other delicious linked meats, plus a variety of toppings to split a long bun. Whatever you’re in the mood for, you’re sure to find it here, where delicious dishes from around the world are on offer for breakfast, lunch and dinner. For a little slice of New York, head for Sorrento’s, where you can enjoy delicious wood-fired pizzas and tempting desserts like gelato and panna cotta. Grab a specialty pie for the whole family, a Cheese & Pepperoni slice for the road, or choose from many Italian favourites from Sorrento’s menu. There’s something for everyone. Sabor is Spanish for flavour and this Mexican eatery certainly lives up to its name, where spicy tacos, zingy margaritas and sizzling fajitas are on the menu. The exceptional menu, elegant setting and signature Royal Caribbean service make this classic restaurant the perfect place for a special occasion. Exclusive to Suite guests and Crown and Anchor® Society Pinnacle Members, this chic venue fuses the distinctive flavours of the Mediterranean with a contemporary Californian twist. Venture down the rabbit hole and ask yourself: What is real and what is imagined? At Wonderland, the chefs twist their culinary kaleidoscopes to invent an elaborate dreamscape of never-before-seen fare. The story begins as you open the menu and find your element – Sun, Ice, Fire, Water, Earth and Dreams-each with a selection of small or shareable fantasies. And magical elixirs that whisper “Drink me” amidst amorphous mirrors, mystery and sensory surprises. The intention of it all becomes more certain with each maddeningly delicious bite. Enjoy a taste of Japan at this stylish restaurant, where handmade sushi, fresh sashimi, and steamed dim sum are made-to-order. Does sitting in the whirlpool make you thirsty? Grab a drink at the solarium Bar. Enjoy a glass of your favourite vino, participate in a wine tasting or sample something new from the ship's world-class cellar. Grab a drink and a seat, and then sit back under one of the impressive glass-domed canopies. Check out the moments that the ship photographers have captured onboard in the photo gallery. A great memento for families and couples. Try your luck at ring toss, skeeball and other beloved carnival games. Sabor - in Spanish, means flavour. But here, it’s that and so much more. A feast - or shall we say fiesta - for the eyes. A vibrant dance across the plate and palate. A long heritage of fresh, simple ingredients, reimagined in full bloom. An authentic English pub offering a great meeting place for pints, people, performances, and more. The heart of every Royal Caribbean ship has added a mezzanine level to make it better than ever. Enjoy a coffee while people-watching in the morning, some shopping and lunch in the afternoon, and endless nightlife and entertainment in the evenings. Family shows, late-night adult comedy and guest entertainers. Enjoy live Jazz nightly in the Jazz on 4 lounge. At Boleros, the music is red hot and the mojitos are sweet and refreshing. Shake your hips like never before at the Royal Promenade’s must-do Latin nightclub. 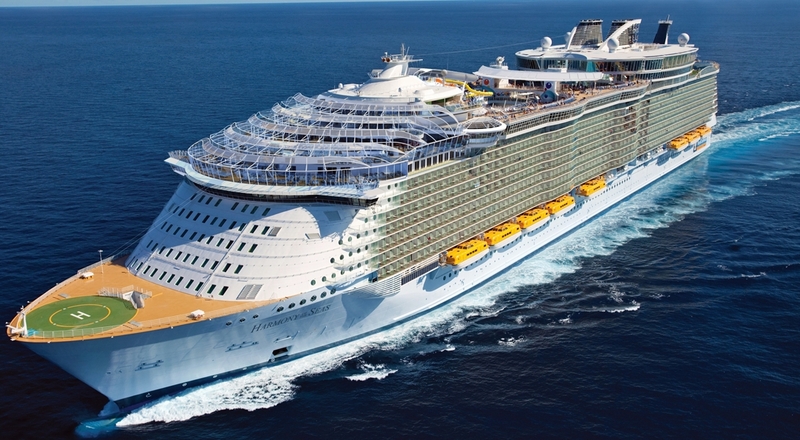 When Royal Caribbean ships hit the high seas, the excitement of Casino Royale® kicks off. Try your hand at their card tables, spin to win at roulette, and hit it big time with the pull of a slot machine. With late hours, a wide variety of games and great payouts, it's the prime place to have a great time while sailing to your next destination. Slip into your dancing shoes for two levels of lights, dancing, and good times at Dazzles. With live music from big band to disco, every night is a new party. The state of the art theatre features Royal Caribbean's award winning Broadway-style theatre productions and aerial acts. Catch shows you can't see anywhere else. Royal Caribbean original productions and a Broadway musical take centre stage in the Royal Theatre. A multipurpose studio complex filled with activity all day long, from ice-skating to cooking demonstrations. In the evenings catch ice shows featuring professional ice skaters from around the world; the costumes are eye-catching and the choreography is exhilarating. Or take a spin on the ice rink. They provide the skates, you show off the moves. Pool by day – Theatre by night. With seating for 600, theatregoers will be dazzled by the spectacular water shows,aerial acrobatics, stunning ocean views and ongoing entertainment. Grab a seat beneath the stars and enjoy breathtaking high dives and water dancing at the open air AquaTheatre, the deepest, most daring pool at sea. An amazing bar that is run by bionic mixologists. As well as being technically innovative, it’s also easy to navigate; all you have to do is submit your drink order, sit back and watch as the bionic bartenders get to work, shaking, stirring and straining two drinks in just one-minute! There’s even a resident DJ, who plays upbeat and contemporary music, so you’ll be able to enjoy a dance with your family and friends, too. The first decision you’ll have to make is whether to enjoy a classic cocktail or create your own drink; to do this you must enter it onto the e-menus, on the tablets available. Once you’ve picked which flavours and spirits are going to feature in your delicious creation, all you have to do is pick the order in which everything will be mixed together, according to the four actions: muddle, stir, shake and strain. Once you’re happy, all that’s left to do is name your drink, submit your order and watch your creation come to life! Alternatively, if you just fancy sipping on one of the classics on offer, then simply select your preferred drink from the e-menu and watch as the bionic bartenders get to work. Treating teenagers more like adults, this programme is a way for them to meet new friends while they enjoy their favourite pastimes, from morning until 2am. As well as sports, gaming, pool parties, dancing and music, teens have their very own designated areas to hang out in such as The Living Room and Fuel teen night club. The Living Room is a great space, with chairs and beanbags scattered around the room, surrounded by foosball, Xboxes and a widescreen TV for movies. Teens are allowed to come and go as they please in the Living Room, there no need to sign in or out. Directly above is Fuel, the teen-only disco. There are dance parties most nights, often with a theme -- Miami night or '90s, for example -- as well as pool parties in the Solarium at the front of the ship. The tiniest cruisers (6-36 months) are kept entertained by trained professionals in the onboard nursery. Offering day and evening drop-off options, so you can leave your little ones while you enjoy some quiet time. Older kids can look forward to the award-winning Youth Zone programme. With three age-specific groups – Aquanauts (3-5 years), Explorers (6-8 years and Voyagers (9-11 years), this award-winning youth programme is so much fun, kids won’t even notice that it’s educational as well! Events run from morning until ten in the evening every day, kids can make new friends whilst enjoying a whole range of activities and games.